The origins of the Great Dane are somewhat controversial and are not known for certain. Some say that the breed originates as far back as Egypt based on Great Dane like drawings. However, the earliest written description of a Great Dane like dog appears in China in 1121 B.C. 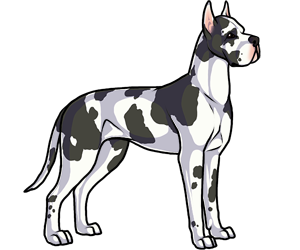 Furthermore there were Great Dane like dogs depicted in Greek money in 36 B.C. Whatever the case, it is generally agreed that the breed we know today was a descendent of the Irish Wolfhound and the Old English Mastiff. The Germans used the breed to hunt wild boar and bear. Today, the breed is less fierce and is generally just used as a companion. The world's tallest dog is a great dane named "Giant George" who is 3 ft 7 inches. Scooby-Doo was based on a Great Dane. Pennsylvania named the Great Dane the its official state dog in 1965. The breed has also been called the German Mastiff and the Danish Hound.